So this past night at work, while I was staring aimlessly towards my machine something hit me. Why haven't I seen any comparisons between Zack Greinke and C.C. Sabatia? So I searched around a little bit and started to compare the stats between the two's time with the Brewers. After finally using some of those ridiculous formulas most of us forgotten from algebra, I started to notice some standout similarities and differences. C.C. 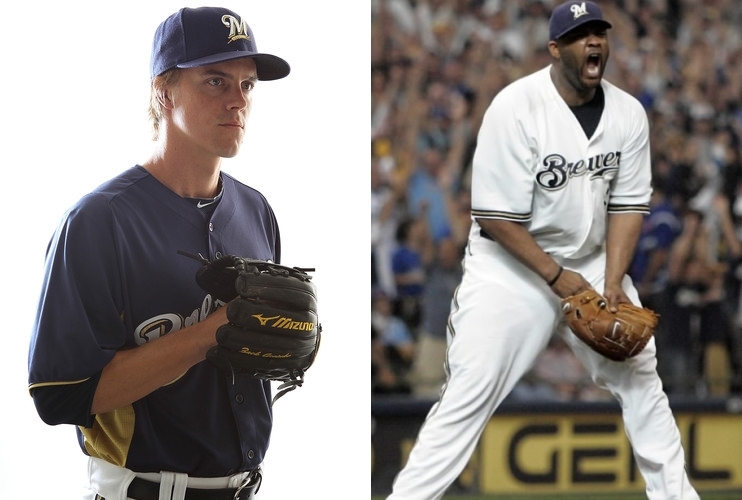 Sabathia and Zack Greinke have both led Milwaukee to playoff births during their tenure with the Brewers. Records: To start, in Greinke's 48 starts with the Brewers over the past season and a half, he is currently sitting at 25 wins and 9 losses. C.C. in his 17 starts with the Crew in half a season, finished his short tenure with 11 wins and 2 losses, as well as 7 complete games. Unfortunately the same can not be said for Greinke who has 0 complete games. That still hasn't hurt Zack in posting a .520 win percentage and you could say it's possibly higher than that due to some great starts in which he got slapped with 14 no decisions, which averages out to just over 29% of all starts (note: all stats are as of 7/21/12). C.C. posted a very respectable .647 win percentage winding up with only 4 no decisions, 23% of all starts , or 3.5x less than Greinke, in 1/3 of the number of starts. Two stats that C.C. dominated in were ERA and home runs per innings pitched. With an era of 1.65 he beats Greinke's two season average of 3.7 by over 2 full points. He also averaged 1 home run every 21.7 innings as opposed to Greinke who comes in at just over 1 HR per every 11 innings. Stats of other importance include but are not limited to; WHIP: Greinke 1.225 averaged out over 2 seasons, C.C. 1.00 in the 17 starts. Opponents batting average: Greinke .253 average, C.C's ended at .222. Strikeouts per inning pitched: Greinke .9 k/inning, C.C. .98 k/inning. Innings pitched, innings per start: Greinke in 287 2/3 in 48 starts comes to 6 (technically 5.99, but who's counting) innings per start, C.C. In 17 starts pitched 130 2/3 innings which comes out to 7 2/3 innings a start. So after doing my "homework", it's pretty clear that the two differ but not greatly. Yes C.C. owns the match-up of the stats, but in Greinke's defense he has been a Brewer nearly 3 times as long. So I'll throw it out there and say that Zack Greinke has done just as much for the Brewers organization as Sabathia did. And like C.C., it could be over soon as it started with Greinke. With struggling performance's as of late and the news breaking of Greinke turning down an offer in the neighborhood of 5 years, $112 million, it would not be a surprise if he gets dealt before the deadline. As well as the last faint glimmer of hope of signing him long-term fading away it won't be long until we have to say so long. So enjoy Greinke while still in a Brewers uniform, because sooner or later, as with C.C., Zack will move on to greener pastures.